Seen in Covent Garden Market, London. Hats can take any outfit up a notch! You can wear hats to beaches, weddings, family functions and elegant parties. 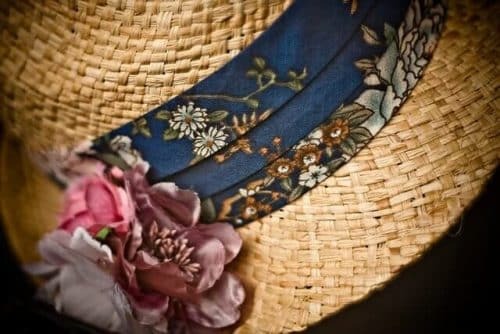 Straw hats can look glamorous if you decorate them according to your attire. Here are some steps to help you decorate a straw hat. or a hat made from 100% paper straw. Wide brim straw hats are known to provide excellent UV protection. Many hats come with adjustable PV leather nick straps and wooden beads. You can select a plain or designer wide brim straw hat. You can check out different types of hats from e4Hats and Luxury Divas. Paste a flowers or beads on the hat- paste a flower on one side of your hat. Paste it on the far left or right hand side on your hat’s front. Using a glue gun, you can also decorate the hat with a string of beads or a brooch. You can simply paste a single flower to keep it simple and sophisticated. to compliment your hat. This item is perfect for women who love the comfort of leggings and femininity of a skirt. You can choose tights with attached skirt from Adidas, Kohl’s and Girl 6X. Compare some dresses online, pick the suitable one and you will surely be able to look great throughout the season!